Toby's sleep patterns have altered in the last week so that come bedtime he spends his time arguing with us 'not bedtime, morgning time, me go downstairs, eat toast'. I guess this would represent a bit of a stress for a lot of parents who find they manage best by adhering to strict daily routines, but for us we find that being flexible and living seasonally works. So while Toby is going through a growth spurt and the evening are light and warm we are making the most of it by heading down to the beach, to the play park or, as we did last night, going foraging. Since we both study with the Open University this does put pressure on our evening study time, but the trade off is that we are spending time together as a family and that is time well spent. As we headed out with our basket and buckets (the 1kg plain yoghurt buckets making another appearance) the boys were all really excited and jumping around like Spring lambs. This was especially impressive given that Ollie had already walked all, and Toby part, of the 6km up and down hills to get to a play day in the park and back. 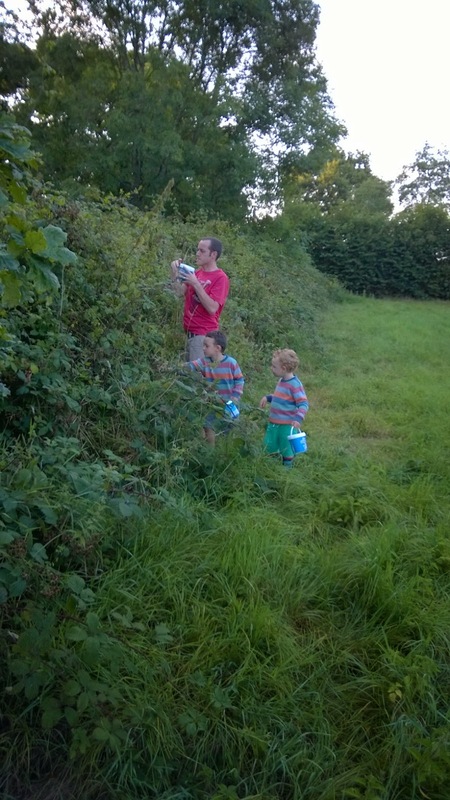 A big part of foraging is remembering where you found the goodies last year, and Ollie has this skill nailed as he charged ahead taking us straight to our best blackberry patch 15 mins walk away. Another important part of foraging is listening to the locals, so courtesy of the boys asking very politely to stroke a dog they met, the dog walker volunteered a great tip about where to find an apple tree we didn't know about. We ended up with a couple of kilos of blackberries and about the same of apples, plus a scattering of nettle stings as foraging tends to mean free food only up to a given definition of 'free'. We picked lightly over the bushes, leaving plenty behind. As we each pick at our own chest height or above we end up picking in layers which means there are plenty that the kids can reach (never from below their chest height to avoid ones dogs might have peed on). 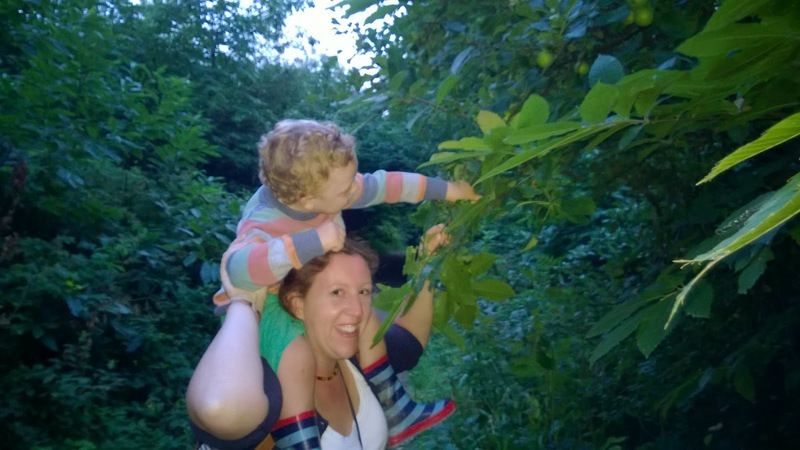 Ollie was especially helpful in reaching the apples as he uses his gymnastics skills to stand on our shoulders. 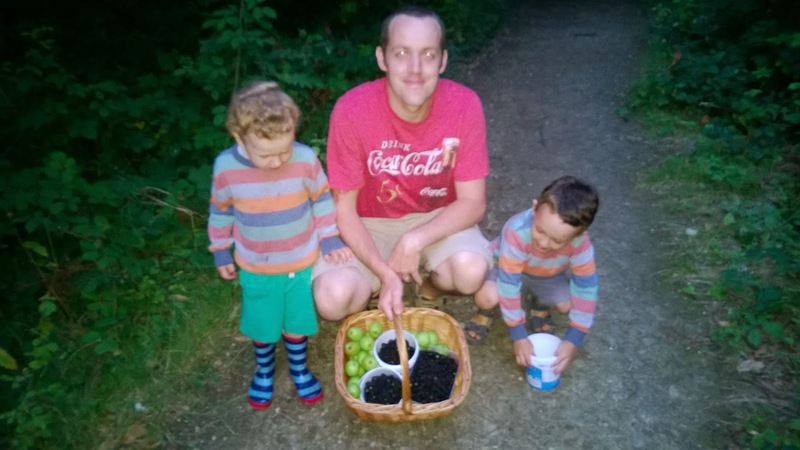 Both boys also ate their own body weight in berries judging by how long they spent picking compared with the six berries each that they put into the basket at the end. Weigh your fruit - you need to know because you will add roughly the same weight of sugar as fruit. Put the berries and apple chunks into a very large pan with a tiny drizzle of water to stop them burning - not too much as they will juice down really quickly. Bring to the boil, then turn down and simmer until it's a big mush, then strain out the pulp so you are just left with the juice. Add sugar (we were about 300g short but since we had a lot of apples this hasn't affected the set) and bring to the boil again, then simmer. 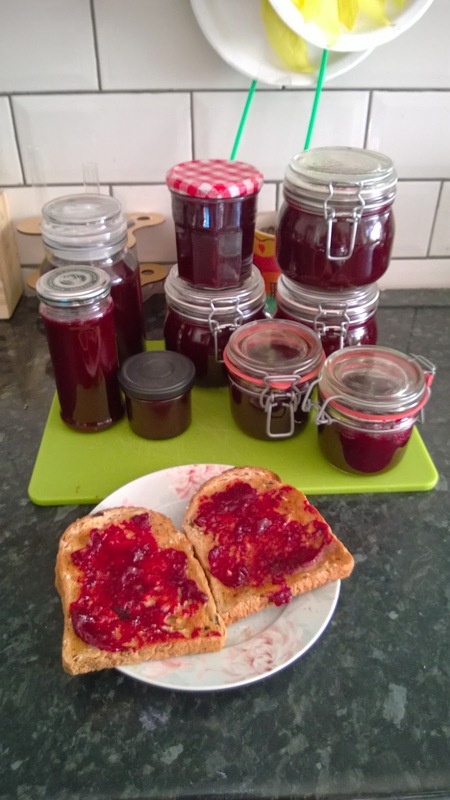 Put plates in the fridge and periodically bring one out, drop a teaspoonful of jam onto it, wait a minute or two then draw a line in the splodge with a spoon - if the line disappears as jam run in to fill it, you need to keep cooking. It's ready when the line stays visible. Pour into your sterilized jars, allow to cool for a little while and then lid while they're still fairly hot. You can use waxed disks too but we never have because the jam is usually eaten up (or given away) too quickly to be worth it. We keep it in the fridge once opened. Blackberry jam, and blackberry and apple jam, are usually a good set so you don't need to add pectin or use jam sugar. Even if it all goes a bit wrong and you end up with blackberry syrup, this is not a problem because it is perfect drizzled over porridge or whizzed up with milk for a delicious milkshake. Safety: When foraging make sure you drill it into your kids not to put anything unfamiliar in their mouths without showing you and getting your OK first. Pick away from busy roads and watch out for the inevitable dog dirt, nettles and blackberry prickles. Old clothes that cover arms and legs and proper boots are the best outfit. Keep small kids well away from the actual jam making since every part of it is a burn/scalding risk. Jam is a particularly nasty scald as the sugar content means it gets incredibly hot and the stickyness means that it sticks on and continues to burn until you get it under a tap, so exercise caution yourself too and I would recommend wearing shoes while you make it in case of spills or dropped jars. Making the jam at night when the kids are asleep is a lovely way to end the day as you fill your home with amazing jam smells and the little ones can wake up to home made jam on toast for breakfast.